William Morris “Snakeshead” printed textile. Lake Pointe Inn is decorated in the tradition of the Arts and Crafts Movement. Beautiful floral motifs and clean-lined wooden furniture furnish our guest rooms and common areas of the inn. Some people aren’t familiar with what this style is, so below are some enlightening details on the Arts and Crafts Movement. The Arts and Crafts Movement originated in England in the 1850s and was started by William Morris and Edward Burne-Jones who were influenced by the writings of John Ruskin. The Arts and Crafts Movement was the result of a search for a new artistic and design aesthetic in the face of mass production and industrialization. The movement emphasized craftsmanship, quality, domesticity and natural beauty. The artists shunned designs that were too ornate and believed in designs that emphasized the qualities of the materials they used. 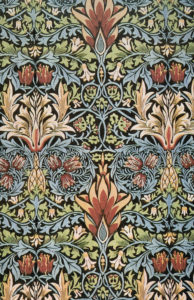 Stylistically, Morris and others involved in the Arts and Crafts Movement gained inspiration from medieval art and Gothic Revival architecture. Artists favored simplistic natural designs with bold shapes and colors rather than ornate decoration that overshadowed what was being decorated. Common subjects for designs of the Arts and Crafts Movement were British florals which were simplified and flat. Some artists left products slightly unfinished to give the object a rustic feeling. The Arts and Craft Movement spread to the United States and several offshoot movements developed with the same premium on handcrafted art, furniture and architecture. The American Craftsman style became popular in architecture and decorative design in the 1930s, some calling it the American Arts and Crafts Movement. Frank Lloyd Wright’s Prairie School was also directly influenced by the Arts and Crafts Movement. 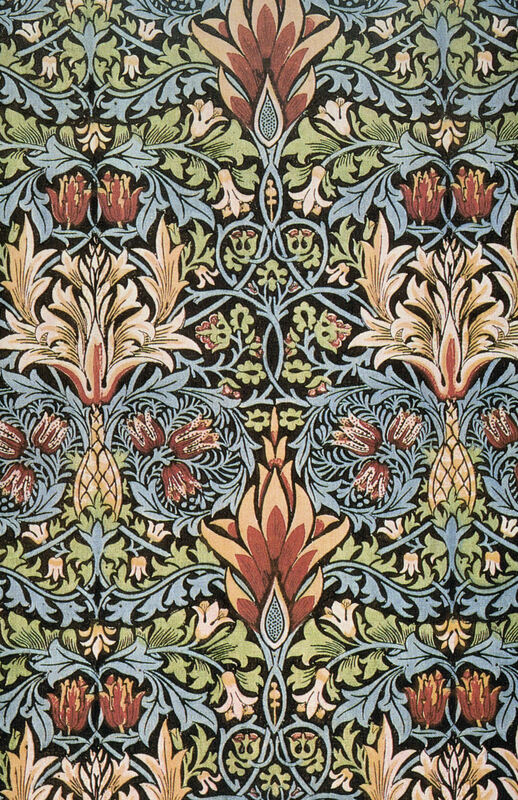 William Morris is the most famous artist associated with the Arts and Crafts Movement and his work still lives on today. His furnishings and decorative arts company Morris & Co. produced textiles and wallpapers that are still popular and Lake Pointe Inn features many Morris & Co. fabrics. To take a look at the Morris & Co. catalogue click here. The furniture at Lake Pointe Inn is also in keeping with the Arts and Crafts Movement. Our rooms are finished with timeless Mission Style furniture. Mission Style furniture is made of solid and sturdy wood with a medium to dark stain. Its signature clean lines and lack of excess ornamentation is accompanied by the fine craftsmanship of the Arts and Crafts Movement. This style of furniture became popular in the U.S. at the end of the 19th century and can be taken as a reaction to the excesses of prior Victorian style and the rise of mass-produced wares during the Industrial Revolution. Click here to read an entertaining and informative excerpt from a 1917 interior design book outlining the virtues of this “modern” furniture, complete with decorating tips. To bask in the beautiful legacy that the Arts and Crafts Movement has left, choose one of Lake Pointe Inn’s beautiful rooms and soak it all in. Our rooms feature Mission Style furniture and upholstery fabrics from the Arts and Crafts Movement along with private baths and gas fireplaces. Choose your perfect get away now!